This is a lovely back roads country drive that takes you up hill and down dale passing ranch land and ancient moss-draped oak trees. Though stunning year-round, this area is particularly spectacular in springtime, when the gentle rolling hills are a vibrant shade of green dotted with the dazzling colors of poppies and other wildflowers. Turn off the US-101 42 miles north of Paso Robles onto CA-198. In 14 miles take a left turn onto CA-25 and continue north. You will be traveling through a valley between the Coast Mountain Range on the left and the Diablo Mountain Range on the right. Ranches, farms and orchards are prevalent here and along with cattle and horses grazing in the fields, you will find roadside stands offering fresh picked produce. Just beyond the turnoff to the town of San Benito is the entrance to Pinnacles National Park. Designated the 59th U.S. National Park in January 2013, Pinnacles National Park is a geological marvel born into existence by a volcanic eruption 23 million years ago approximately 195 miles south in the Lancaster area of Southern California. Lying along the San Andreas Fault, plate tectonics split the rocks and moved the massive mountain, historically 8000 feet in height and five miles wide, north to where it rests now. The settling of debris and erosion have sculpted the exposed ramparts, leaving towering pillars, massive walls and talus caves that are now the crowning glory of Pinnacles. Pinnacles National Park has two entrances, one to the west off US-101 at Soledad and to the east on CA-146 where our drive continues. At the Pinnacles National Park Visitor Center (I1) you will find information on ranger-led programming, various hiking trails, rock climbing routes, displays on the flora and fauna and the geologic history of the region. Explore the wonders via an easy hike on Bench Trail (some parts are wheelchair accessible), which travels along the scrubby brush chaparral landscape. More moderate is the 2.2-mile Moses Spring to Rim Trail Loop which passes fascinating rock formations, caves and reservoir. 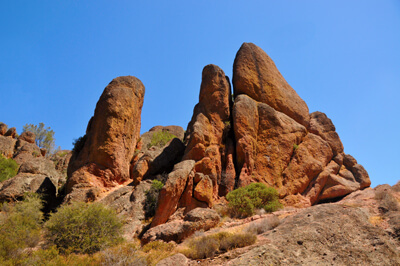 If you’re up for a very strenuous climb, consider the Condor Gulch to High Peaks Loop which cuts through the heart of Pinnacles breathtaking rock formations revealing jaw-dropping views. The Park features two talus caves created from huge toppled rocks and though not completely underground, having a flashlight is required to explore. Bear Gulch Cave is home to Townsend’s big-eared bats and between mid-May through mid-July, the cave is closed to protect the colony of bats as they raise their young. Check the park website for updates on closures. Balconies Cave, closer to the west entrance, is open all year. Note that CA-146 is not a through road and no roads cross the park, so you must plan which entrance is closer to the activities you’re interested in. CA-146 is also narrow and curvy, and not recommended for RVs, large vehicles and trailers. The park’s biodiversity hosts a wide variety of wildlife including many migrating bird species, resident hawks, falcons and California condor. Over 400 bee species can be found here — the highest bee diversity on earth as well as butterflies, tarantulas, lizards, rattlesnakes, black-tailed deer, wild turkeys and gray fox. The campground (near the east entrance) features tent and RV sites and a swimming pool which is typically open from April to September. If you visit in summer, be prepared for extremely hot temperatures. And in any season, be sure to have a lot of water with you whether hiking or simply picnicking. There is an entrance fee covered by the America the Beautiful Annual Pass. Back on CA-25 continue 31 miles north, through the town of Hollister to route 156. Head west and you will soon arrive at the historic city of San Juan Bautista. This small agricultural town named after Saint John the Baptist is packed with history and charm. Founded in 1797, it boasts the largest of the 21 California missions. The San Juan Bautista Mission (A1) is beautifully-designed, replete with painted murals and tile work, and is the only mission with a three-aisle entrance to the altar. Stroll the peaceful gardens blooming with heirloom roses and cacti. Just beyond the Mission cemetery is an original portion of El Camino Real — the “Royal Road” which once connected all 21 California missions. There is a small admission fee to tour the Mission. Adjacent to the mission, is San Juan Bautista State Historic Park (H1) which features the only remaining Spanish Plaza in California. Surrounding the plaza which was once a vital town square, are 30 historic buildings including the Plaza Hotel which is now the park entrance and museum, hall and stables, a blacksmith shop, a livery stable with antique carriages, a granary, jail, and the Castro-Breen Adobe. Rooms are furnished with antiques and period furniture and artifacts. The first Saturday of every month features Living History Days with costumed interpreters and special events. All California State Parks charge a day use fee that varies from park to park. On the National Register of Historic Places, the San Juan Bautista Commercial District is a delight, with antiques and collectibles, art galleries, unique shops, wineries and restaurants. Take the historic walking tour to discover 48 sites within five downtown blocks. Highlights are the Glad Tidings Church built in Greek Revival style, the Crane house that reflects a Cape Cod influence, the Masonic Hall, Honeymoon House, and the John Anderson House, an authentic Victorian structure. While in the area, wine lovers will want to explore the local vineyards and wineries along the San Benito County Wine Trail. From here you can either return via CA-156 to the US-101 or retrace your route back on CA-156 north through Hollister to CA-152 and drive over the Pacheco Pass to see outstanding views from the visitor center at the San Luis Reservoir (W1). The region is a haven for anglers fishing for largemouth black bass, striped bass, crappie, perch and occasionally salmon. Here you will also find boating, board sailing, picnicking and camping. During winter months look for bald eagles, owls, golden eagles and large flocks of migrating geese and ducks. On the other side of California Highway 152 is O’Neill Forebay Wildlife Area (H2), a forebay to the San Luis Reservoir created by the construction of O’Neill Dam. Fishing is popular here as well, and within 700-acres of artificial waterways and riparian habitats you will discover a wide range of recreation opportunities. A return trip takes you back the way you came or for an alternate route back you can take Country Road G13 (T1) from CA-25 through the hills and into King City, then south on the US-101, or for those traveling north continue on CA-152 to the US-101 North. Or if you’re ready to explore more of California, follow the US-101 south to CA-1 to the Big Sur Scenic Drive.